DA Form 4824 - also known as the "Addendum To Certificate And Acknowledgement Of Service Requirements (da Form 3540) For All Personnel Applying For Participation In The Reserve Officer Training Corps (rotc)/simultaneous Membership Program (smp)" - is a Military form issued and used by the United States Department of the Army. The form - often mistakenly referred to as the DD form 4824 - was last revised on April 1, 2005. Download an up-to-date fillable PDF version of the DA 4824 below or request a copy through the chain of command. Title 10 USC Section 270, 10 USC 511, 10 USC 673a and Executive Order 9397, 22 November 1943.
insure that your agreement to these conditions is a matter of record. removal from the program if the requirements are not met. Disclosure of your SSN is voluntary; however, if not provided you will not be accepted into the program. Section IV, Chapter 8, AR 140-111.
successfully completed MS II; or I have successfully completed ROTC Basic Camp. Read and initial paragraphs 2a through 2f, h, i, j, l, and m.
entrance in ROTC/SMP. Read and initial paragraphs 2a through 2f, h, i, j, l, and m.
Option 2: Enlistment for ROTC/SMP with no previous military service or ROTC credit placement for enrollment in Advanced ROTC. SMP. Read and initial paragraphs 2a through g, i, j, k, and m.
a. Previous military service and have successfully completed a basic training course conducted by US Armed Forces. as credit placement for enrollment in Advanced ROTC, has been issued and is available to the recruiting officials. c. Have attended a Service Academy for one year. d. Have successfully completed MS II. Read and initial each paragraph 2 a through 2m. participating in the Advanced ROTC Program. Read and initial paragraphs 2a, b, c, d, i, j, k, and m.
a. I understand the ROTC/SMP is a voluntary officer training program which requires Reserve Component enlisted status for eligibility. concurrently with ROTC Advanced Course training, when computing length of service for any purpose. prior to acceptance of such scholarships. baccalaureate degree within six months. e. I am not ineligible to enroll in the Advanced ROTC Program as provided in paragraph 3-14, AR 145-1.
active duty for training not previously completed. the grade and rank authorized by AR 140-158.
provisions of DA Circular 135-23, or similiar Federal directives. required to pay back some, or all, of the money I have received prior to my assignment to an officer-trainee position. 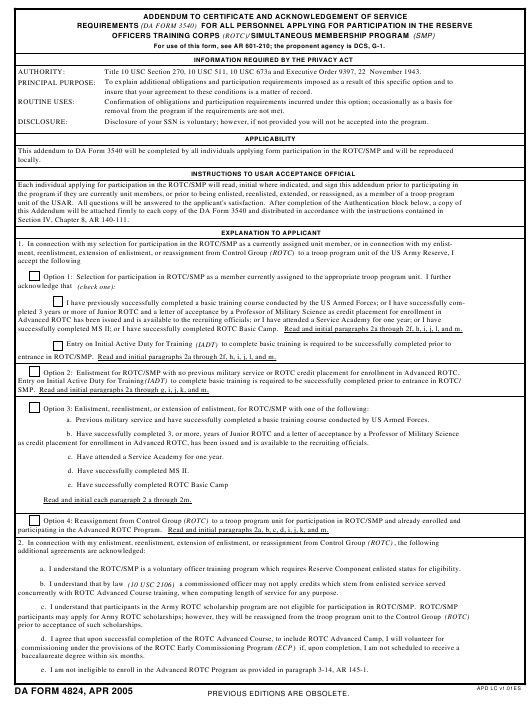 my application for said program should I remain in an enlisted status upon removal from the ROTC/SMP.